"The home has, verily, its foundation in the wife"
During the Vedic age, more than 3,000 years ago, women were assigned a high place in society. They shared an equal standing with their men folk and enjoyed a kind of liberty that actually had societal sanctions. The ancient Hindu philosophical concept of 'shakti', the feminine principle of energy, was also a product of this age. This took the form of worship of the female idols or goddesses. The feminine forms of the Absolute and the popular Hindu goddesses are believed to have taken shape in the Vedic era. These female forms came to represent different feminine qualities and energies of the Brahman. Goddess Kali portrays the destructive energy, Durga the protective, Lakshmi the nourishing, and Saraswati the creative. 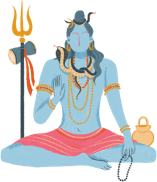 Here it's notable that Hinduism recognizes both the masculine and feminine attributes of the Divine, and that without honoring the feminine aspects, one cannot claim to know God in his entirety. So we also have many male-female divine-duos like Radha-Krishna, Sita-Rama, Uma-Mahesh, and Lakshmi-Narayan, where the female form is usually addressed first. Women, who so desired, could undergo the sacred thread ceremony or 'Upanayana' (a sacrament to pursue Vedic studies), which is only meant for males even to this day. The mention of female scholars and sages of the Vedic age like Vac, Ambhrni, Romasa, Gargi, Khona in the Vedic lore corroborates this view. These highly intelligent and greatly learned women, who chose the path of Vedic studies, were called 'brahmavadinis', and women who opted out of education for married life were called 'sadyovadhus'. Co-education seems to have existed in this period and both the sexes got equal attention from the teacher. Moreover, ladies from the Kshatriya caste received martial arts courses and arms training. Eight types of marriage were prevalent in the Vedic age, of which four were more prominent. The first was 'brahma', where the daughter was given as gift to a good man learned in the Vedas; the second was 'daiva' , where the daughter was given as a gift to the presiding priest of a Vedic sacrifice. 'Arsa' was the third kind where the groom had to pay to get the lady, and 'prajapatya', the fourth kind, where the father gave his daughter to a man who promised monogamy and faithfulness. In the Vedic age there was both the custom of 'Kanyavivaha' where the marriage of a pre-puberty girl was arranged by her parents and 'praudhavivaha' where the girls were married off after attaining puberty. Then there was also the custom of 'Swayamvara' where girls, usually of royal families, had the freedom to choose her husband from among the eligible bachelors invited to her house for the occasion. As in present, after marriage, the girl became a 'grihini' (wife) and was considered 'ardhangini' or one half of her husband's being. Both of them constituted the 'griha' or home, and she was considered its 'samrajni' (queen or mistress) and had an equal share in the performance of religious rites. Divorce and remarriage of women were allowed under very special conditions. If a woman lost her husband, she was not forced to undergo the merciless practices that cropped up in later years. She was not compelled to tonsure her head, nor was she forced to wear red sari and commit 'sahagamana' or dying on the funeral pyre of the dead husband. If they chose to, they could live a life of a 'sanyasin' or hermit, after the husband passed away. Prostitutes were very much a part of the Vedic society. They were allowed to make a living, but their lives were regulated by a code of conduct. They came to be known as 'devadasis' - the girls who were married to God in a temple and expected to spend the rest of the life as his maid serving the men in the society. When Did Alexander the Great Invade India? Did You Know the Hindu Calendar Has 6 Seasons? What Do India's National Anthem and National Song Mean? What Was the Ganesha Milk Miracle?